The glaze is a little spicy, for less spice use less chipotles. We have also made these ribs and used a store bought BBQ sauce - American Stockyard BBQ Sauce Texas Hill Country, same sauce used at Rutherford Grill, according to their menu. Goes with the Brown Sugar Baked Beans and Snap Pea Salad with Buttermilk Dressing. For the ribs: Combine the spices together in a small bowl. Remove the silver skin from the underside of the ribs by sliding your fingers under the think membrane and pulling it off. Repeat with the second rack. (Or have your butcher remove silver skin for you.) Rub the ribs with the seasoning on both sides. Place in a single layer in a large roasting pan (or sheet pan lined with foil) and cover tightly with foil. Place the pan into the oven and back until the ribs are tender, about 80 to 90 minutes. Take the foil off, and cook another 20 minutes. For the sauce: In the bowl of a food processor, add all the glaze ingredients and purée. Transfer mixture to a small saucepan and bring to a simmer over medium heat. Cook glaze uncovered, stirring occasionally, until sauce is thickened and reduced to a syrupy consistency, about 10 minutes. To serve: Let ribs rest 5 minutes before slicing into individual ribs. 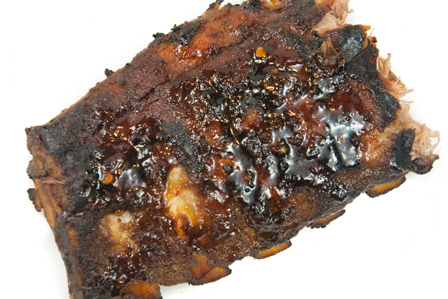 Serve ribs with extra glaze on the side.